Belau, now called Palau, is an island country located in the western Pacific Ocean. The country contains approximately 340 islands, forming the western chain of the Caroline Islands in Micronesia.The islands' culture mixes Micronesian, Melanesian, Asian, and Western elements. Ethnic Palauans, the majority of the population, are of mixed Micronesian, Melanesian, and Austronesian descent. A smaller proportion of the population is descended from Japanese and Filipino settlers. The country's two official languages are Palauan (a member of the wider Sunda–Sulawesi language group) and English, with Japanese, Sonsorolese and Tobian recognized as regional languages. The country was occupied and made part of the Spanish East Indies in 1574. Following Spain's defeat in the Spanish–American War in 1898, the islands were sold to Imperial Germany. During World War I, the Imperial Japanese Navy conquered Palau which was later made a part of the Japanese-ruled South Pacific Mandate by the League of Nations. After World War II, Palau was made a part of the United States-governed Trust Territory of the Pacific Islands in 1947. Having voted against joining the Federated States of Micronesia in 1979, the islands gained full sovereignty in 1994 under a Compact of Free Association with the United States. 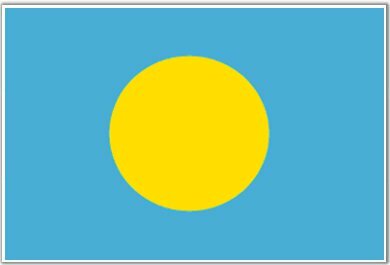 Politically, Palau is a presidential republic in free association with the United States, which provides defence, funding, and access to social services. Legislative power is concentrated in the bicameral Palau National Congress. Palau's economy is based mainly on tourism, subsistence agriculture and fishing, with a significant portion of gross national product derived from foreign aid. Palau is one of a total of six former members of UNPO (together with Armenia, Estonia, Georgia, Latvia and Timor-Leste) who subsequently achieved full independence and gained representation in the United Nations.